Truly the best for your event! 3-window 8' version pictured. 2-window 6' version also available. Casino Parties: A Fundraising Humdinger! 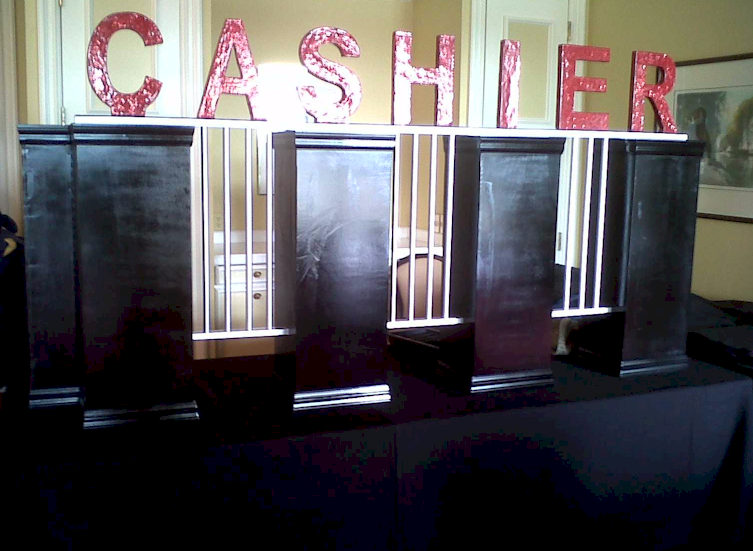 We specialize in charitable casino party fundraisers! If you have indeed decided on a Casino Night for your organization, we got you covered with fanciful equipment and exclusive benefits! Please use this informative page as an added resource to help initially stage your fundraising casino event. "Increase your Revenue while Promoting your Contributors"
If you are seeking donations and sponsors in advance of your fundraising event, consider offering potential contributors the opportunity to underwrite a particular aspect of the event (in addition to any opportunities that you may offer to make specified cash or merchandise donations) and put their name in print for all guests to see (in relation to the value of the donation). For example: Consider offering potential contributors the opportunity to sponsor a particular game in the casino, such as one or more Blackjack Games. If a contributor sponsors a large portion of the event you could place their name on a variety of banner sizes. If a contributor sponsors a smaller portion of the event their name could be in print on a variety of different sized signage near their sponsored feature such as on the table sign of a particular game. In addition to any opportunities that you offer to underwrite aspects of your event, consider offering potential contributors the chance to sponsor the Staffing Needs! For example: With the first above tip in mind, you may be offering contributors opportunities to sponsor individual games in the casino. Consider offering them the chance to sponsor the staff in one of two ways: 1.) They could contribute the cost of the dealer ...or... 2.) Contribute the cost of the dealer by being the dealer. This will do two things for you: It will save you on the cost of the casino games and it will save you having to recruit as many volunteer dealers on your own. You could also take this a step further and offer potential contributors the chance to contribute even more by underwriting the cost of a dealer AND being the dealer - this will raise even more funds for your cause while still giving the sponsor some excitement from the other side of his or her table. So why not make it a PARTY?! At one time or another we have all felt that warm feeling inside that only comes from helping someone. A casino party is a marvelous and fun opportunity to raise funds. As there is often a shortage of funds, there is no shortage of charities struggling to meet the demand for assistance. Whether you are a social organization representative, or just someone who holds a soft spot in your heart for, or feels a connection to a particular charity or cause, congratulations on taking a look at a festive casino party as a way to raise funding dollars! We take pride in helping people help others. and Everyone is a winner! If you have ever thrown a party then you can throw a charitable fundraiser event. We will be with you at every stage and will work hard to ensure that your event is a well-planned success. ~ FREE PROMOTIONAL FLYER (a $50 value). With your input, we will design and create for you a free promotional flyer to help advertise your event. ~ DONATION OPTIONS. Are you wondering how much you should ask guests to donate? A good common amount is a $20 cash donation receives $1000 in fun money or $100 receives $5000 in fun money. Also always consider the table limits. We offer $25 min. and $1,000 max bet by default but you can specify other amounts. Be sure to consider a higher minimum bet as well as a higher maximum bet. Try to never offer "any" as a limit because bets could be as low as $1. We recommend considering $25-$100 min. bets and "no limit" for max bets. Your table limits WILL INFLUENCE how often guests return to donate again. Please look over our newly updated Donation Options page. If you like, you can create your own or we can help you choose an option. ~ DONATION AMOUNT SIGNS. No need to worry about producing a chart to let guests know how much they can donate - we provide these for you at no charge! ~ FREE FUN MONEY in black & white copies always included. If you would like to personalize your event, we can also provide you with black & white on colored paper or brilliant full color money in a variety of paper types, please see our Event Toolbox. And the money is yours to keep! ~ ADDED SECURITY. Our authentic professional custom gaming cheques (chips) provide added security for your fundraiser in that there are no others like them in circulation anywhere. Our chips are not available in stores-we use only genuine Paulson and Chipco chips, the exclusive supplier to 100% of mainstream casinos. ~ ADDED REVENUE. We instruct our dealers to rake from all pot games so that your organization can earn money from specific tables. At your option we can also rake a percentage of ALL GAMES. In addition, we adhere to 'By-the-Book' odds and rules for your fundraiser with only the limited bonuses found in casinos. If your fundraiser is an internal one, we can always revert back to our 'relaxed odds' in which we throw in all sorts of winning combinations! ~ ON-SITE EVALUATION (free) of your party facility and FREE FLOORPLAN. As always, we will work hand in hand on logistical issues with your facility contact- so you don't have to! ~ GREAT ADVICE while planning your event every step of the way! ~ EXPERIENCED EVENT MANAGEMENT. Wash your hands of the workload! We can plan all or part of your next event. Custom Wall Banners, indoor or outdoor. We are your TOTAL EVENT CONTRACTORS! Even if you have never had a fancy for the idea, a Casino Party Fundraiser is a spectacular charity event. Over the years we have discovered that people are usually uninformed about the legality of such events. We have spent years researching the issue. Current Kansas Statutes are available upon request: K.S.A. 21-4302 and 21-4303 defines Gambling, 21-4304 and 21-4305 has to do with Commercial Gambling and 21-4306, 07 and 08 relate to Gambling Devices. Gambling is illegal in Kansas except for Licensed Bingo, Pari-Mutuel Racing, Tribal Gaming and The Kansas Lottery. With any of Pair-A-Dice’s casino-theme parties no gambling is ever allowed or condoned. We encourage people to live out their gaming fantasies at one of many legal gaming venues. (a) “Bet” means a bargain in which the parties agree that, dependent upon chance, one stands to win or lose something of value specified in the agreement. (b) “Lottery” means an enterprise wherein for a consideration the participants are given an opportunity to win a prize, the award of which is determined by chance. (c) “Consideration” means anything which is a commercial or financial advantage to the promoter or a disadvantage to any participant. Las Vegas or Casino Nights constitute a "lottery" that is specifically prohibited by the state's gambling law. A lottery is defined as.....an enterprise wherein for consideration the participants are given an opportunity to win a prize, the award of which is determined by chance.” Consideration is the payment by a person of money or anything of value. The three elements of a Lottery are Prize, Chance and Consideration. Remove any one of those elements and there is no lottery. All promotional materials, tickets, signs and advertisements should bear a statement that all contributions are strictly voluntary. Amounts of voluntary contribution may be suggested, however, under Kansas law it is illegal to require a person make a specific donation or contribution in order to participate in a Las Vegas or Casino Night. Individuals are under no obligation to make a contribution and may not be barred from participation if they choose not to make any donation. It is illegal to require any person to make a donation or contribution in order to gain admittance to "casino night" to play the games. He or she should not be ridiculed. He or she should be given a reasonable amount of “play money”, in accordance with that of other guests, but not an excessive amount. He or she does not have to be provided with meal and/ or beverages, etc. at no cost, but does have to be admitted to games of chance at no cost. If you charge an admittance fee, let your guests know that the fee is for their dinner, beverages or other entertainment. The casino games are essentially free, or by donation. Compile your guest list vigilantly. Your guests will be more quick to donate to a cause that they feel a personal connection to. Be careful of large public events that are mass marketed. You may not raise all your intended funds. A Lottery is made up of three essential elements: Chance, Consideration and Prize. If you remove one of these elements of gambling, there is no gambling. Chance: A casino party is made up of games of chance exclusively. Consideration: At every casino party we have ever done there have been prizes, however no player has ever been required to pay money to win them. If any guest had ever been required to pay money to play games of chance to win a prize there would have been consideration, and that would have been gambling. We remove the consideration every time! As another example, we often coordinate an event at a public club. In this instance, we remove the prize. Guests pay to play but just for fun, to try their luck, there is no prize to be won. With Charitable Fundraisers there is a twist: People pay money to play, there are games of chance and there are prizes. With our charitable fundraising events we remove the consideration as well. Consideration is the payment by a person of money or anything of value for participation in a game of chance to win a prize. Individuals must never be required to donate to the charity, this would constitute gambling, there is no exception in the law-not even for charitable or non-profit organizations. The number one question asked by our clients is: "Can we charge (a designated amount) for the evening package which includes dinner, drinks, other entertainment AND a stack of 'fun money'? The answer to this in short is no. Simply put, this would be gambling. Law enforcement organizations do not "look the other way" when it comes to gambling for charity. You would word it like this: "Your admission package includes dinner, drinks and entertainment. Casino Games are also available for a suggested donation." If you bet a penny to win a dollar - it is still gambling. So you might wonder “Will I be able to raise the money for my charity”? The answer is YES! Figure how much you want to raise and how many people will attend. We have a simple formula to help you determine suggested donation amounts, choose from several options. It is also a good idea to choose a legitimate, well recognized, worthwhile organization as the beneficiary of your fundraising event. Those who attend your event will not mind donating to such a worthy cause. Wichita Charities. Also visit http://www.charitynavigator.org/. If someone does not wish to donate, they must still be given equal opportunity to win any prizes. It is recommended that they receive a reasonable amount of “funny money”, proportionate to others at the event, for the duration of the party and be subject to no ridicule. If a vice officer showed up at a private event and sought participation in the games of chance for free, he should be admitted. If there was any door charge that included, say a dinner and the games, you do not have to provide the dinner, but you do have to provide him a chance to win any prizes, which would be a stack of 'fun money' or chips to admit him to the games. Call or Text us anytime at (316) 755-6303 to book your Charity 'Fun-Raiser' CASINO PARTY! Select a cause, set an initial budget for non donated items and select a date and time for your event. Call us at 821-0202 to check availability for your event. Ask us about banquet facilities, catering and decorations as well as over 80 other forms of entertainment- There are some undeniable “Crowd Drawing” activities available. In addition, ANY or all forms of entertainment that you select CAN be coordinated as a “WAGER PACKAGE”- We will create the perfect wagers and incorporate them into your casino! The ultimate success of your event will be measured from your guest’s initial excitement. How big do you want your event to be? Be sure to select a party facility that can hold the number of guests that you expect to attend. Make sure there is enough room for entertainment, tables and all the guests. Be sure to choose a facility that offers the amenities that you require, such as catering. If your facility does not offer catering, make sure that you include this in your planning. You can make the food yourself, have guests bring a dish or hire a caterer. From the start or along the way, if you are ever pressed for time- Relax then Rest Easy and put us on the job! At Amerifun, we will do it All! Consider advertising for your event. If you desire TV, many local stations can produce a commercial for you and air it several times for under $500. You can also get a copy from them for distribution to other TV stations. You can also seek out a Production Company or a College TV Station to produce your commercial and then you can hand-carry the copy(s) to your chosen TV stations. With Radio there are no production costs and you can air your message for under $100. You can also run an announcement in a local newspaper or publication. Furthermore don’t forget promotional items such as personalized merchandise, signage and T-shirts. Look to Amerifun for great product promotion ideas. You will also want to comprise an invitation mailing list of potential guests. Ask us about Custom Printing or Delivery Services. Most importantly, you need Prizes. If prizes are not in your budget, compile a list of potential prize contributors. Use your creativity and professional contacts to call on organizations and individuals to donate items that you will use as prizes. Be sure to ask us about our Prize Services. Prizes will add to the excitement and give guests incentive to donate more! Now let's raise some funds! We can arrange to deliver your 'fun money' before the event if you would like to break it down into stacks or envelopes. We can assign our Teller to distribute funds according to a spreadsheet that your generate. We can also provide you with pre-printed vouchers (their ticket to the casino) if all receive the same amount of funds. Efficient, effortless Initial Funds Distribution. As guests enter they will receive their chance to donate (unless you distributed funds beforehand). Guests then enter the gaming area and purchase their chips with their 'fun money'. At the end of the evening guests redeem their chips and leftover fun money to their dealer or cashier for prize opportunities. P Choose a legitimate foundation as the beneficiary. P Choose a date and times for your event. P Contact us to check availability for your event and ask about all available entertainment for your date. We offer over 80 different forms of entertainment and any or all can be incorporated into your casino. P Ask us about venue assistance or catering options. P Ask us about promotion ideas or use your own. make an invitation mailing list. P List prize ideas and contributors, ask us about prize solicitation services. 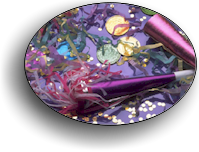 P Look to Amerifun for theme props and decorations including flowers, balloons, party rentals, party supplies, photographers or limousine rentals. P Order Supplies, Tableware, Linens, and Centerpieces. Select Menu and Drinks. P Order Invitations. Contact us for you complimentary flyer custom designed for your charitable event- A $50 Value- free with your order! P Ask us about promotion ideas such as personalized merchandise and signage. P Solicit donated prizes in the name of your charity. P Mail out invitations, ask guests to RSVP. P Plan other activities and door prizes. P Pick up any party supplies and decorations that you arranged for yourself. P Order cake and food that you will not prepare yourself. Prepare and freeze food that you will make yourself. P Contact any guests who have not yet confirmed. P Re-confirm all your orders - anything that you contracted with Amerifun is already taken care of! P Check batteries and film in camera and camcorders. P Buy any remaining food items or supplies. P Pick up or receive special orders. P Begin to decorate the party area. P Pick up cake and ordered foods. P Prepare food that can be made ahead of time. P Prepare food and beverages that could not be made ahead of time. P Decorate outside party area(s) including Balloons. P Enjoy your party and congratulate yourself on a well planned event! This site is designed to provide an overview of our casino party services in Wichita, Kansas. For more comprehensive information, please visit our sister site at www.amerifun.us. 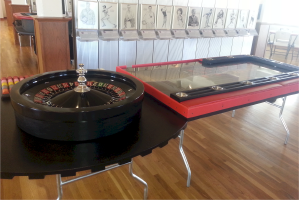 Casino Parties Wichita, Casino Party, Casino Charity Fundraiser, Casino Equipment and Rentals for Casino Party in Wichita or the surrounding areas and Kansas. Casino Supplies for Wichita Fundraisers, Corporate Parties, Holiday Parties or Theme Parties in Wichita KS. Have a Casino Party from Casino Parties of Wichita by Amerifun. Casino Parties Wichita, Casino Party Wichita, Wichita Casino Party, Fundraiser Wichita, Wichita Casino Theme, Casino Games Wichita, Corporate Entertainment Wichita KS, Wichita Casino, Wichita Holiday Parties, Poker Wichita, Blackjack Wichita, Wichita Poker, Wichita Company Parties, Seminar and Trade Show Entertainment Wichita, Wichita Corporate Parties.